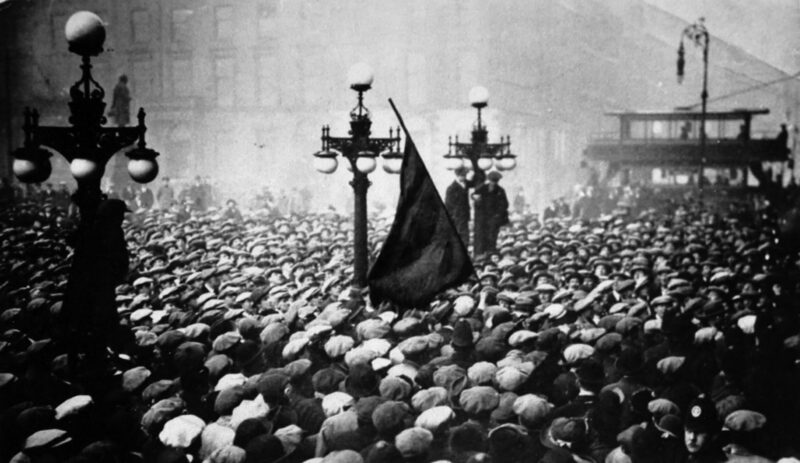 Home / Articles / George Square 1919: no real revolutionary threat? January 31 is the centenary of Bloody Friday 1919, in which thousands of protesting workers were attacked in Glasgow’s main civic square by police, causing multiple injuries. Coming barely a year after the Russian Revolution and with insurgency in the air across much of Europe, then Scottish Secretary Robert Munro claimed that Glasgow was in the midst of a “Bolshevist uprising”. Prime Minister David Lloyd George’s cabinet famously deployed soldiers and tanks to the city, fearing this was a revolutionary moment that could spread around the country. Across Clydeside and elsewhere, workers protested against poor conditions again and again during the war years, striking in mines, factories and shipyards. They wanted the working week to be cut from a 54-hour average to 40 hours, and fought attempts by employers to drive down wages and roll back hard-won improvements to conditions. In parallel, tenants were fighting rent increases by private landlords, culminating in the famous Clydeside rent strike of 1915. This was the beginning of the period of militancy later known as Red Clydeside, which would last until the 1930s. Contrary to popular belief, there was no military presence that day. Troops did not start arriving until the evening, and no tanks rolled onto the streets until the following Monday. Soldiers remained visible across the centre of the city for the next couple of weeks, guarding tram depots, electricity stations and bridges. There was a heavy military presence in George Square, including machine guns mounted on turrets. Several strike leaders, including militant union leader Willie Gallacher, were arrested and given jail sentences.